Dental curettage consists in removing the dental plaque from a periodontal pocket that is formed between the tooth and the gum, in order to allow the gum to reattach to the tooth. The curettage is indicated in cases where the tartar is so deeply entered into gingival cavity wall that is impossible to remove it by scaling. Dental curettage allow to remove both, the cause of the infection (dental plaque) and the collateral damage of it (infected tissue). 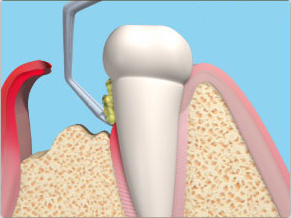 Curettage is performed under the local anesthesia and can be open or closed. Closed curettage is performed without the incision, while the open one requires the opening of gums and it is rarely undertaken, only in cases of severe periodontitis. Although the dental curettage prevents the development of gum diseases and helps indirectly to preserve the general heath, it is not refunded by a Social Security.